Earth Mantra is pleased to welcome the second release by Mike Metlay on our humble little netlabel, and what a treat this delightful release is. A singular longform piece clocking in at close to 56 uninterrupted minutes, this lovely album was inspired by a scene from Night on the Galactic Railroad, a motion picture that Mike describes as "unquestionably the weirdest animated movie I have ever seen". But however strange the original inspiration might be, there is nothing the least bit strange about this soothing and achingly beautiful recording. Entitled eocene, this album could not be more different from metric, the previous Metlay! release on Earth Mantra. Where the previous album was abstract and textural, eocene is thoroughly tonal light ambience, with nothing more than a single synthesizer played to perfection straight into a recording machine. A minimal composition recorded using a minimum of equipment and processing, to be sure, but what is most remarkable about eocene is how dynamic it is. Never does the music feel static, nor does the active listener ever lose interest in the piece, despite its length and despite the fact a single instrument with a single unchanging timbre is used throughout the entire length of the piece. A remarkable achievement, and a testament to the quality of the composition itself, something that is too often overlooked in modern ambience. Mike describes the piece as intended for "ambient meditation", and we couldn't agree more. The music is thoroughly trance-inducing, making it perfectly suited for meditation, for sleep listening, or simply for relaxation with a set of headphones in a darkened room. However you listen to it, it is certain to put a smile on your face and a sense of balance in your heart. 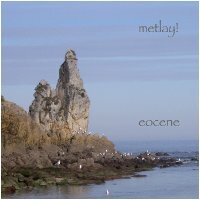 We're very happy to bring this exquisite album to our listeners, and hope that there will be much more from Metlay! in this vein in the future.